We hadn't had a showing in weeks, the house was a mess and it was time for the baby's nap. My son was throwing a tantrum because I couldn't understand what he was trying to say which meant that mac and cheese I made for lunch was all over the floor. The phone rang. It was the realtor. Someone wanted to come see the house in an hour. I had a one hour window to make it look like no one lived there. Such is life when you're trying to move with children. I've moved my fair share of times in recent years. As a stay at home dad and husband of a hard working corporate mom, you have to be willing to seize opportunities when they come your way. That was the case in 2008 when my wife was offered a position in her hometown of Rochester, NY. She had lived all over the place before she met me and was ready to strike while the iron was hot. I had at the time, never lived outside of the Chicago area and spent the first thirty-three years of life living near family and friends in Illinois, the same state I attended college to become a teacher. Ten years into the public school system as an art teacher, we decided to move away and start over in a new city where I knew no one. At the time, we only had two kids, ages three and 8 months but the multitude of toys that covered the house was staggering. We knew after shopping for our first house that to be show ready, a home needed to be staged. It needed to look like no one lived there so that anyone who did want to see it wouldn't be hampered by the superheroes and blocks strewn about the floor. Instead of seeing the wall to wall plush carpet, they would only see that maybe this house wasn't meant for them because they didn't like kids. Whatever the reason, moving with children can be difficult and stressful. But it doesn't have to be if you follow these steps which make it easier for you and the kids. All kids have their usual toys that they can't live without. We have found that unless you take them out where they can see them, kids don't REALLY know what they have in the toy department. That's why every time you go to a store and walk past the toy aisle they will say they want something. They have no idea what is in their inventory. So, when they are sleeping, pack up the toys they hardly ever play with in boxes and label them toys but place them in a closet with these words facing in. If they never see them, they probably will never ask. Getting rid of excess toys will cut down on the times when someone wants to look at your house and when your move date arrives, you'll be less stressed. As visions of gummy worms dance in their heads, you should take this opportunity to throw away anything that is unnecessary. All those McDonald's toys or the junk they get at birthday parties needs to disappear like an informant with cement shoes. Word to the wise, if you do throw things out, don't throw them in a high trafficked trash bin where they might see it and place all the throw-aways in a dark black plastic bag to avoid any accidental discoveries of their favorite popsicle stick they can't believe you are throwing away. Pro tip for all of you out there looking for boxes. Moving stores are going to rip you off. Liquor stores have an abundance of boxes but while plentiful, most of them are not practical for packing. Look on Craigslist for someone who has recently moved who would like to unload their boxes. 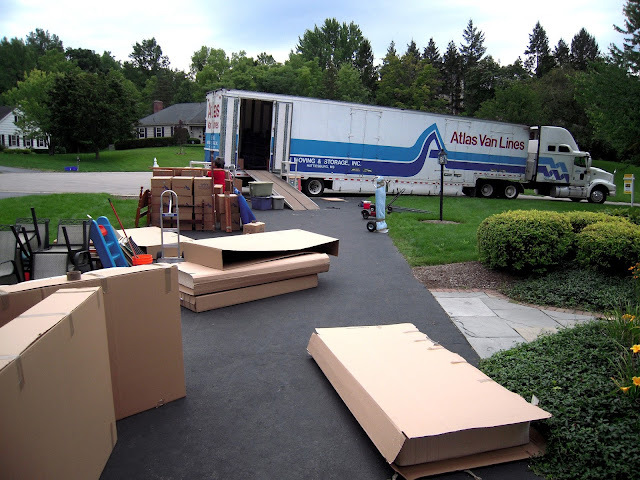 When we moved the first time, we were relocated and the movers provided boxes. Instead of recycling them at the new house, I separated them by size and sold them on Craigslist for a dollar a box and charged five for wardrobe boxes or speciality boxes for transfer of art or mirrors. A former provider who I believed I cancelled service with, continued to charge me even after we moved out of the house where the service was provided. Keep records of who you talked to and when while dealing with hooking up new services or cancelling old ones. Luckily, when we moved into our new home we were pleasantly surprised to find out that the house was already equipped with Verizon FiOS. If you've never had their 100% fiber optic network, get ready for crystal clear picture and a network that you can count on. Find out before moving if Verizon FiOS is available in your new neighborhood before you decide that it's just easier to go with what most other people in the area have. The last thing you want is to be in a new home with no access to the kids' favorite shows when you want to keep them busy while you unpack. Our daughter didn't understand the concept of packing things into a box and finding it later at the new house. The last thing you want to do is pack something away that they MUST have with them like a special blankie or stuffed animal they won't sleep without. Pack these things in a backpack so that they can have their essentials. Any other needs should be packed in their own special box that they can put in your car or ship to the new house. Our kids loved opening up boxes on the other end and discovering what was inside so try to make it a little fun for them. 6. Prepare the children for adventure! Show your kids on a map where you will be moving to. Make it fun if you are driving to your new house to play car bingo or airplane bingo. Include on cards things they may see along the way that are landmarks of the new home or area. Getting the kids excited about where they are headed instead of focusing on where they have been can help with the sadness of leaving. Spend the day prior to going to the new house at an attraction close to home so they can see that moving can be fun. There will be a time for furniture that they can't put their legs on and beds that aren't as hard as the floor. Our first week in the new house, we ate dinner on a cardboard box and sat on the floor together while we ate. Sometimes, before the TV is even set up, this can be a great way to get to know your house. Sleep together in sleeping bags in a common area so they can get used to household noises or the settling of newer house. There's less apprehension about staying in a room you don't know if you've spent the night there with your loved ones before. For more info visit Verizon's page to get Tips for Moving and share yours in the comments or on my Facebook page DadNCharge. Happy moving!